When did the earthquake occur? 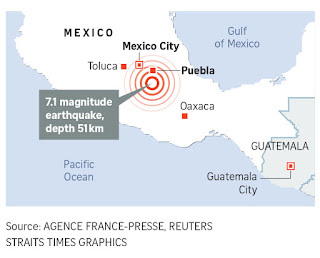 What was the magnitude of the earthquake and how does this affect the extent of damage in Mexico? 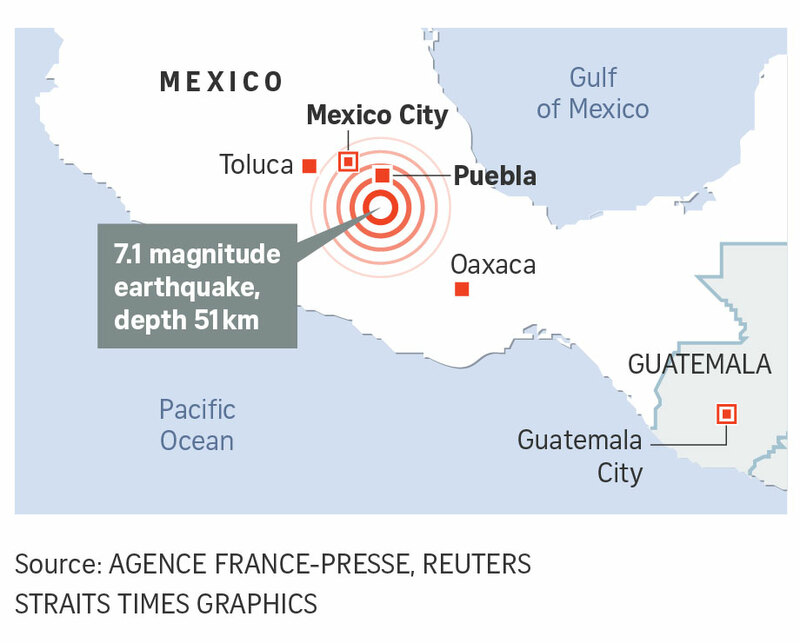 How does the geology of Mexico city affect the extent of damage? Aftershocks are expected - will there be greater destruction? Do take note of the following when you evaluate the factors which affect the extent of damage as shown by the map above. 1. Proximity to epicentre - Which city is nearest to the epicentre? Why do areas closer to the epicentre experience greater damage and deaths? 2. Magnitude of the earthquake - What is the magnitude of the earthquake? Why does earthquake of higher magnitude results in greater damage and deaths? 3. Depth of focus - What is the depth of the focus? Is it shallow or deep? Why does a shallow-focus earthquake results in greater damage and deaths? 4. Population Density - Which city has a higher population density (no. of people living on a unit area)? Why do cities with high population density experience greater damage and deaths? 5. Geology - Mexico city is built on soft volcanic soil and clay. Why would the geology of the area affects the extent of damage and deaths? What is liquefaction? 6. Time of occurence - The earthquake occured at 1.15pm (local time). How would this affect the extent of damage and deaths? 7. Level of preparedness - Just hours before the earthquake, many people went through an evacuation drill as it is the anniversary of a major earthquake which struck Mexico on 19 Seppt 1985. How does higher level of preparedness reduce the extent of damage and deaths? 0 Response to "7.1 magnitude earthquake struck Mexico"